In any interview, when the question put forth to you is ‘What is your management style?’ you are at crossroads to answer the question convincingly. Perspective of every individual varies; so does his ideas and implementation. No two people react in a similar way to a situation. And to put forth your perspective of your management style to the people sitting in front of you, is rather a tricky and tough situation. 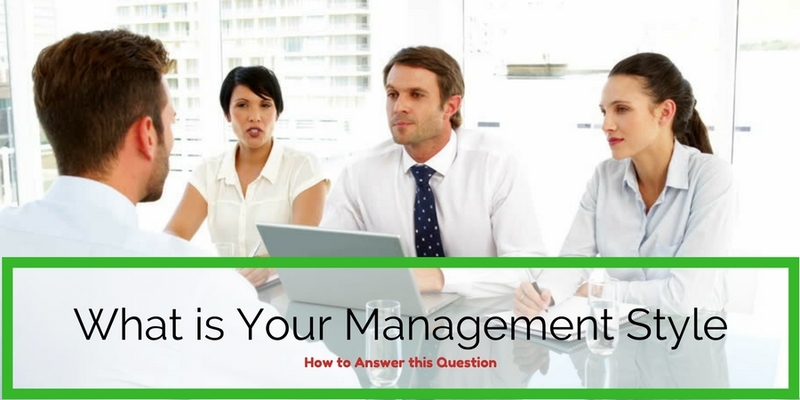 Your answer should be not only about your management style but also about how it is going to impact you, your team and the organization as a whole. Don’t go on and on about your strengths, but explain to them how your strength will benefit the firm. Your focus should be on the firm and not on you. Remember that you will be hired only when they feel that you would be a value added asset to the firm. They are not concerned about your inherent or acquired managerial skills, but they are interested to know how your skills can be advantageous to the organization. Well, yes. Haven’t you heard of ‘action speaks louder than words’? If you are a latecomer at work, how would you expect your subordinates to report to duty on time? If you are not prompt at work and do not keep up your word, what message are you delivering to your employees? Remember, employees tend to follow their leaders and they look up to you for guidance. So no double standards allowed here on your part. In essence, only theoretical lectures will not suffice. When are you willing to show the employees how to approach and deliver the task successfully, then the employees will start to obey you. How will you be able to win the trust of others when you don’t practice what you intend others should do for you? It is as simple as that. If you want your employees to follow what you say, then be sure to be a source of inspiration to them. Be sympathetic to your employees. Understand their concerns. Yes, targets have to be attained, but not at the cost of being unpopular figure among your workers. Only when you work with them and when they feel that you are one among them, they will start respecting you. Only then you will be a leader of the masses. Each individual wants appreciation for the good work he has done. That keeps him motivated and encouraged to do more. Now, it is the duty of each manager to unfailingly appreciate and acknowledge the employee whenever he does a good job. This may be accomplished in many ways. A raise in salary or bonus is not feasible every time, but incentives can be in the form of appreciation of achievement in front of the whole team. This simple act makes a vast difference in your employee performance. In today’s changing scenario, a manager needs to be flexible in his ideas and implementation. The manager should first be adaptable to the constant changes taking place. And remember, the ability of each individual employee cannot be measured by the same yardstick. Be flexible in your approach and understand that each employee needs to be tended to in a different manner. Encourage the staff to think independently. When they come up with ideas and suggestions, do value them and try to incorporate this in your work. If their views are valued by you, they will be inspired to do more. Constant negligence of their ideas can dampen their spirit of hard work. Of course, why will they ever try to contribute their views when it is never taken seriously? Never ever be rigid in ideas and its implementation. Try new ideas and experiment them at work. After all change is the only constant thing in life and at work also. So never resist change. Encourage new ideas from others and from yourself also and never hesitate to implement them. Obviously, so. When your vision is clear about what you want them to do and it is conveyed to them in a clear fashion and not in a roundabout way, only then will the staff get an idea of how to move ahead with their respective jobs. Divide the work as per the caliber of each person, assign work accordingly, keep a constant tab on the work, assist the staff whenever required, keep them motivated constantly, crack the whip if and when necessary, keep the staff informed about the progress required and the time available; your work will be done. Treat all your subordinates as one. The ranks from the lower to the upper individual should not be made obvious to them when you want to get your job done. Each individual should be treated on par with the rest and should be given equal weightage and prominence. And it should be an open communication organization where everyone can open up without the fear of his views getting suppressed. This helps in trust building within the organization. The best output a person can give is when he is not under any pressure to perform the task as per the needs and conditions of others. Give each staff his space to perform. You needn’t keep him constantly reminded about what he ought to do and the way he has to do. Only when you give him space, he will be able to come up with his distinctive style of work which will benefit the company. So when you know what are the ingredients to be a successful manager, you can put forth your answer to the question. Just assimilate all the above factors and answer honestly and confidently. So finally what would your answer be? “My management style is to lead by example and to practice what I preach. I am genuinely open to new ideas and see how it can be successfully implemented. I am a people’s leader and not necessarily only a manager. But do add that you do not stick to one rule and that you are willing to change your management style according to the situation. Why Does a Manager Need to Adapt to Situations to be Successful? That is because bookish knowledge will not help to become a successful manager. You become wise with experience. Situations teach you what is best and what isn’t. And you have to be willing to learn and constantly update yourself with the changing trends and demands. The education concept what you have learnt is to get good grades and improve your knowledge. But the experience what you get from working is to update that knowledge and adapt yourself to situations. A manager should assess the situation first and then decide on what is to be done keeping the interests of the staff and the company in mind. And remember when you are a manager you are going to have a whole lot of different individuals under you. There is this problem of diversity in your workplace which should be dealt sensitively. You need to ensure that your work gets done and all the while your flock stays together. Flexibility is the key here. There is no hard and fast rule that things should be done this way only. Stretch your rules to suit individual needs and circumstances. And a good manager is able to recognize where and how he should adapt to situations keeping the interests of the staff and the firm foremost. So be sure to give prominence to the above point in your answer. How would you include this clause in your answer? Would you mind following up your answer with an effective example? A brief narration of an example is the fulcrum of your answer. When you say about the adaptability thing, be sure to mention a previous experience of how you implemented the flexibility quotient at work. Why do you need to narrate this to the interviewers? This is to give them evidence of your progress at work. The story would let them analyze about how you implemented your ideas and got them working. Remember; do not keep the narrative long and boring. It should be upto the point and convey what it necessarily is meant to be. Tell them what the situation was. Inform them about the difficulties and problems that surfaced. Next tell them what your task was in that particular project. Tell them the role assigned to you. Now tell them how you implemented your ideas in that task so that each and every area of difficulties was dealt with in an effective manner. Tell them about the action plan which was performed to sort out the problem. Lastly let them know how your were able to overcome the problem scenarios and how you successfully got the work done. Tell them how your result was applauded and appreciated. Wouldn’t you be honest by letting them know the things you need to improve on? Not a must, you may say. But then this is definitely not to show your areas of weakness. These are areas where you need to work on. These are areas where you need to improve. These may not be areas of major concern. It may be minor or non issues. But then why take the risk by blurting out areas where you need to improve on? This shows your willingness to learn. Deliver the message to the interviewers that you are always trying to improvise and improve even in issues which are not much of a consequence. Show them that you take your work seriously and that you are a keen observer and an avid learner. Always know that there is no perfect answer to the question “What’s your management style?” It depends on how convincingly you put forth your answer with confidence. The interviewer wants to know where exactly you would fit in and also if you would be a good fit. Define the answer according to what best you know. Follow it up with one or two examples to prove them your capability. Throw in a few unique features which set you apart from the rest. Don’t exaggerate on any one point only. There is a time limit to the interview. Try to convey the management skills you have. Let them know that you are willing to improve. Also know that you have to prove them of your uniqueness and the core focus should be on your strengths. Answering the question is challenging but not impossible. Be honest, be precise and you will definitely meet their expectations and pass the interview with flying colors.